COMPANIES already grappling with the manpower crunch and escalating labour costs will take yet another hit tomorrow when the latest round of foreign worker levy hikes kick in. While the labour-intensive construction, food and beverage, hospitality and retail sectors will bear the brunt of the rise again, firms say they have had time to factor in higher costs, given that the increase was announced last year. The monthly levies for foreign workers on work permits and S Passes will increase in the service, manufacturing, construction, process and marine sectors from tomorrow, with rises ranging from $15 to $200. Firms are now paying a monthly levy of between $250 and $750 for each foreign worker. The amount depends on the industry, level of skill of the worker and the employer's dependency on foreign workers as a percentage of total workforce. Levy increases began in 2010, with another round to come in July next year - part of a series of government measures to slow the inflow of lower-skilled foreign workers and encourage firms to boost productivity. Association of Small and Medium Enterprises president Kurt Wee said most firms are aware of the impending increase and are likely to have already made price adjustments. The latest hike will put a tighter squeeze on companies already feeling "tremendous pressure" from the labour crunch, said Mr Wee. But "there is not much that businesses can do about the rising foreign worker levies except to raise productivity - they don't have a choice". 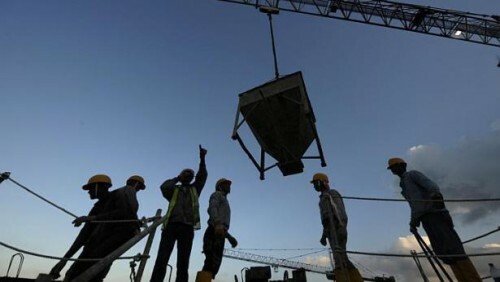 A spokesman for construction and property group KSH Holdings said the latest increase is "of no surprise to the members of the construction industry". Monthly levies will increase to a record $950 for each lower-skilled foreign worker hired by construction firms from tomorrow. The spokesman added that the anticipated increase in costs has already been taken into consideration, particularly in the firm's tendering process for projects. "We have also been putting effort in increasing productivity, increasing efficiency of labour usage and improving our engineering and operational processes to tackle the issues." The company had previously said lower-skilled foreign workers make up about a third of the foreigners it employs. Wah & Hua senior business manager Melissa Tan said "ample time" has been given for companies to prepare for the increase. In addition to making price adjustments to its contracts, the waste collection and recycling company has also been trying to hire more Singaporeans and permanent residents. "We are working very hard, trying to improve the industry's image and create a good working environment," said Ms Tan. Companies have to make changes to work processes to ensure that hiring lower-skilled foreign workers is "still justifiable in terms of cost-performance benefit", said Mr Erman Tan, president of the Singapore Human Resources Institute. The latest round of hikes might be easier for companies to bear given that "the economy is in a better state than previous years", said UOB economist Francis Tan. However, sectors like construction, retail and food and beverage - long viewed as productivity laggards - are "likely to feel the heat more strongly", Mr Tan added.